Do you know the difference in the CAPM and PMP Certifications for Project Management? One of the most common questions I get from new and experienced project managers is whether they should appear for CAPM or the PMP exam. So I thought to answer this here in a detailed post, so you all can choose the right Project Management Certification for yourself. Both PMP and CAPM are certification designed by the Project Management Institute. So what is the difference between PMP and CAPM? PMP is for project managers with years of experience. Well, at least 3 years of experience leading & managing projects is required. This means that they are active project managers who are familiar with the life cycle of a project, has dealt with customers, stakeholders, and has complete a few project life cycles from begining to the end. CAPM is for people who are starting out in their career as Project Managers and have no experience in managing projects, or for people who are team members in a project, and want to demonstrate their project management knowledge. If you do not have any experience in projects at all, but you have the Diploma, you can also attend a formal training in Project Management for atleast 23 hours, and qualify to sit for the CAPM exam. PMP: For Doing PMP, you need to have at least a Bachelor’s Degree, and 4500 hours of experience in leading and managing projects. You also need to attend formal project management training for at least 35 hours. This can be classroom training, or online training (like the one PMChamp provides. Click here to know more). If you do not have a degree, but you have a High School Diploma, you can still sit for PMP certification, but your experience requirements are increased to 7,500 hours. You still need the 35 contact hours of formal project management Training. PMP: Exam fees for PMP is US$555 for Non Members, and US$405 for Members. One Year Membership is US$129. CAPM: Exam fees for PMP is US$300 for Non Members, and US$225 for Members. One Year Membership is US$129. PMP: Once you pass the PMP exam, it is valid for the next 3 years. During these three years, you must collect another 60 PDUs to renew your PMP Certification for another 3 Years. CAPM: Once you pass the CAPM exam, it is valid for 5 years. After this, you can upgrade to the PMP Certification. PMP: The Exam is 4 hours in duration, and tests you for 200 questions. 25 of these are pre-test questions, which are not testeable. CAPM: The Exam is 3 hours in duration, and tests you on 150 questions, 15 of which are pre-test questions, not testeable. The study material for both the exams is the same – The Project Management Body of Knowledge (PMBOK Guide), Sixth Edition. You can also attend the same Training for CAPM or PMP. Attending a PMP Exam Preparation Training is good for both these exams. The PMP Exam Prep training is more holistic, and people aspiring for the CAPM certification can still learn a lot more about the entire project management life cycle. Both the exams are held at Prometric Centres around the world. Both are Computer Based Tests. The PMP Exam Changed – What has changed? And the most popular article – How my career accelerated after getting PMP Certification. Hope this helps. Let me know if you have any questions. You can post them as comments below. P.S. The next Online PMP Training Workshop begins this week. 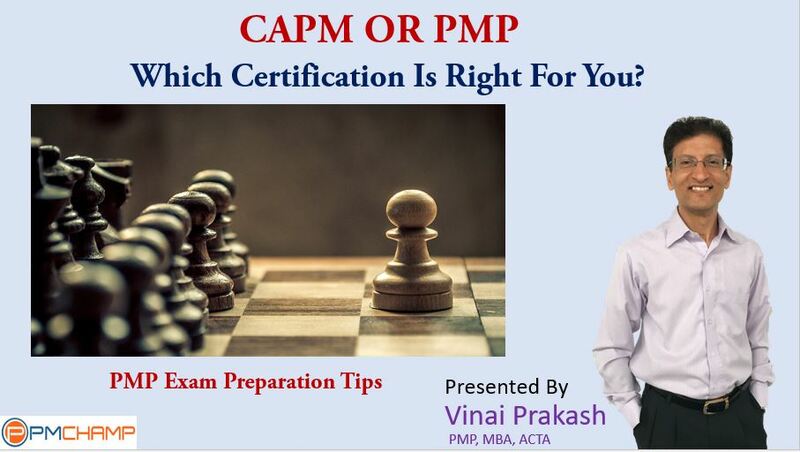 If you are preparing for the PMP or CAPM exam, you should join it. Click here to get started quickly. Hello, very good post. But what I’ll like to understand is if you have CAPM do you write a new PMP exam to get the PMP certification credential or you just apply after fulfilling the reamining years of the experience. You have to write the PMP exam once you have the 3+ years of experience, even if you have the CAPM.